(NaturalNews) Suffering from brain fog, chronic fatigue or insomnia? How about depression, migraines or inflammation? If so, you may have a problem with an internal mold infection. Associated with an astounding number of health issues, mold toxicity is a common -- although often hidden -- source of declining health. Thriving in humid climates, or wherever water damage is present, the fungus releases spores into the environment, which infiltrate the air, along with carpet and furniture, clothing, mattresses and bedding. People living or working within these spaces inhale the spores, which then reproduce in the body and (for the more harmful varieties) subsequently release mycotoxins. 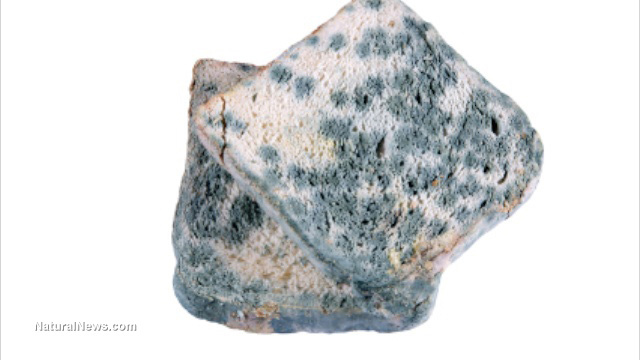 Mold and mycotoxins can be ingested through contaminated food as well. You can learn more about this hazard here. Those with suppressed immunity, leaky gut syndrome or other health issues are at higher risk for developing a problem with mold. It's important to remember, however, that a large majority of the population is suffering from low-grade immunity issues due to the near constant bombardment of environmental pollutants, genetically modified organisms and decline of nutrients in the food supply. If you believe that you have an issue with mold, the following protocol can help. 1. Of primary concern is to establish whether your home or work environment is mold-toxic by hiring a qualified inspector. Keep in mind that, oftentimes, mold may not be readily apparent -- especially if there's black mold growing within the wall, bedding or furniture. 2. Once the environment has been thoroughly evaluated, and the moldy structure remedied, installing a full-house HEPA air-purifying system is the next course of action. Cleaning surfaces with white vinegar or ammonia helps remove fungal spores as well. If you live in a damp climate, a dehumidifier will help keep spores in check. Also, keep air-conditioning units in good repair and opt for annual cleanings. 3. Diet is crucial when contending with mold infections. Avoid edibles that "feed" mold, such as coffee and black tea, sugar, starches, grains, cheese, refined carbohydrates, fermented foods, soy sauce, vinegar (except unpasteurized apple cider vinegar), peanuts, pistachios, mushrooms and yeast (both brewers and nutritional). In addition, always source B vitamins that are free from yeast or mold cultures. Likewise, many antibiotics are derived from mold. Instead, focus on berries, non-starch vegetables (with the exception of carrots, which are antifungal), grass-fed meats, pastured poultry and eggs, sardines, wild-caught salmon, yogurt and kefir. Additionally, chia, hemp and pumpkin seeds, walnuts, almonds, pecans, coconut and olive oil, garlic, ginger and turmeric are excellent foods too. And stevia is a good alternative sweetener. For a full list of safe foods, have a look at the Kaufmann antifungal diet. Mycotoxins--toxic substances produced by fungi or molds--are ubiquitous in the environment and are capable of damaging multiple biochemical mechanisms, resulting in a variety of human symptoms referred to collectively as "mycotoxicosis." In fact, mycotoxins mimic multiple xenobiotics, not only with respect to their ultimate damage, but also in their routes of detoxification. This suggests potential therapeutic options for the challenging treatment of mycotoxicosis. In this brief review, the author examines the use of lipoic acid as an example of an inexpensive and available nutrient that has been shown to protect against, or reverse, the adverse health effects of mycotoxins.